When you've ticked off performances at all of London's iconic gig venues, ranging from the Royal Albert Hall to the Brixton Academy (multiple times, too), Hammersmith Odeon to the much-missed Astoria, playing at a new venue in the city must be a bit daunting. Scene of the latest stop on this Out In The Fields Of Winter Tour, the indigo at The 02 is very much the famed arena’s more welcoming and charming sibling; possibly the Poppy Delevingne to the Cara, if you will. It’s neither awkwardly intimate nor hideously big, but how would it fare for show three? “I normally prefer the small, sweaty clubs,” admitted bassist Stel. “This isn't that. But it's a good place for a gig, the sound is always good in new venues, so that's immediately one less worry, especially as playing in London is always a little bit weird. It's a pressure show, as it's always the one the industry people come to, but tonight we just went out and got on with playing. 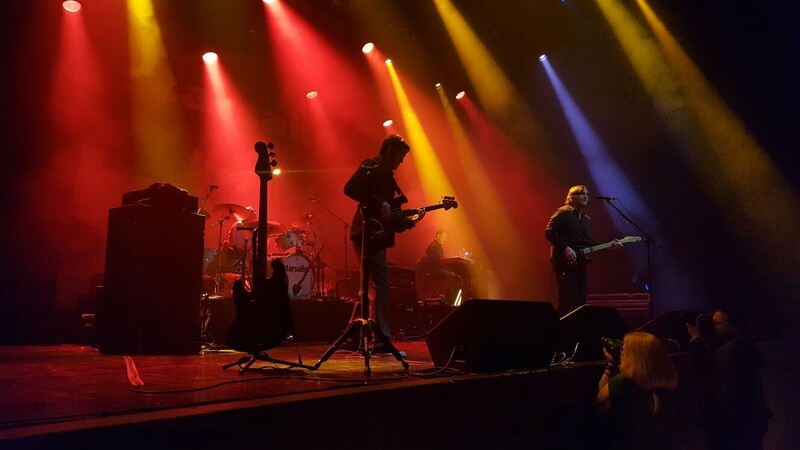 I loved it.” After an excellent opening night in Royal Leamington Spa on Sunday, and an equally as triumphant first Brighton show in over a decade 24 hours later, Wednesday’s London outing clearly showed the band have more than hit their stride. Of course, as the dates pass by and the four band members reignite that chemistry that has prompted rave reviews of their live shows over the years, that’s to be expected. But some groups struggle to get this well-honed after hundreds of shows together. Segues between songs were sharper, endings that little bit tighter, and the introduction of “In My Blood” at song two in the set was a welcome addition. Stel, whose Saturday job playing with Spiritualized has kept him on the road for most of the past couple of years, was clearly in the groove throughout. Subtle but sweet freestyled bass riffs during the likes of “Alcoholic”, “Fever” and “Four To The Floor” highlighted how underrated a musician he is. “I can't say it's the best I've ever played – if I say that, that puts pressure on me for the next shows,” he joked. Alongside him on the stage, Ben Byrne on drums and keyboard player Barry Westhead were their fine, dependable selves. That may not seem like a huge compliment, but trust me, it is. Neither are flashy, nor do they go over the top, but they both form a huge part of the band's room-filling sound. Has anyone ever heard them mess up on stage? Thought not. Standing directly in front of the speakers on Wednesday night, which prompted my ears to still ring the following morning, Barry's ad-libbed synth parts and Ben's ferocious drumming during “Way To Fall” helped create the best performance I've ever heard of that song. Upfront, singer and guitarist James Walsh was a man on a mission. Not content with adding extracts of East 17's “Stay Another Day” and Paul McCartney's “Wonderful Christmastime” to proceedings, he was dancing around the stage like Springsteen during “Tell Me It's Not Over”, and ended up on Barry's keyboard riser for the final couple of bars. Time and time again he moved around the stage, microphone in hand, encouraging the crowd to join in with him, while his delivery of the “wipe the cobwebs away” line in “Good Souls” to end the show was sung with goosebump-creating intensity. Then there’s the London audience. At times, the crowds in the capital can be tough to please, perhaps a product of having so much entertainment on their doorsteps every night of the week. But, just as they were at Shepherd’s Bush Empire on the final night of the 2015 UK Tour (another legendary venue the band have played at), those inside the indigo were infectious. Their level of enthusiasm was more Friday night in Liverpool as opposed to a weekday in London. One girl was repeatedly up dancing on her partner's shoulders, much to the annoyance of venue security, and once again the audience respectfully took in the two new songs in the set, “Blood” and “Best Of You”, which continue to evolve the more they're played. “The crowd were rowdy tonight,” said Stel. “The noisier they are, the better for us.” Worry, what worry? It turns out that playing the indigo was an inspired choice. Nick Bull, by day a sports writer, has seen over 50 Starsailor concerts. looking forward to Norwich gig on Saturday! Sheffield next Tuesday. Buzzing for it. Loved the gig at Indigo but the volume was deafening in the balcony!! Starsailor @ the 02 Oxford June 7th 2017: Great Gig, loved the new songs?? Anyone knows the setlist please post? Great live band! If you have not seen these guys live, your missing out! !